Grand Valley State University students had the opportunity to learn about effective leadership from the chief of the second-largest city in Michigan. Grand Rapids Mayor Rosalynn Bliss spoke at GVSU on Wednesday, April 4, for the Kenneth Venderbush Leadership Keynote. Bliss, who in 2016 became the first woman to become mayor in Grand Rapids, shared advice on believing in others, finding balance and making the most out of transitions in life. The Venderbush Leadership Keynote is an annual program at GVSU designed to recognize exceptional leadership as well as honor the memory of the late Venderbush. Bliss shared her journey from growing up in Northern Michigan to becoming Grand Rapids' mayor. 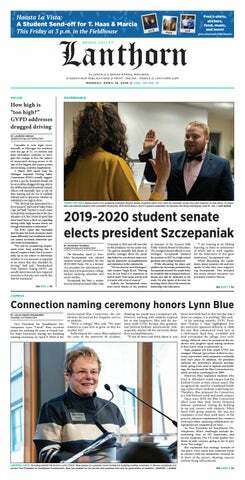 She told the audience, which included GVSU President Thomas Haas, various members of student senate and GVSU students, that her ability to lead has been improved by building relationships over time. Bliss cited her relationships with other leaders, such as her predecessor George Heartwell, former Grand Rapids Mayor John Logie and various women in other positions of power, as ways to constantly evolve in her role. Bliss, who described herself as an overachiever, also highlighted the importance of transitions in everyday life. She explained that we often fear change but that it's during those moments that the biggest personal growth can take place. “Transitions are really opportunities for transformation," she said. "When we’re not really sure what’s coming next, taking a risk, stepping out there can be terrifying. Transitions in life are like being on trapeze bars." Bliss said graduating college is a great example of being in transition. "Some of you are getting ready to let go of the trapeze bar of college,” she said. “You have this safe place, this bar that you're holding onto, and you're getting ready to let go. You might not know where you're going to be, what job you're going to be at. Bliss, who is in her third year in office, also reminded students that their voice is valued. This is especially true in the greater Grand Rapids community, according to Bliss. She said that diversity, whether age, race or gender, contributes positively to the city. Having young members of the Grand Rapids community become vocal and involved improves the city, Bliss said. "We need to hear from you: What is it about the city that you love? What should we change?" she said. "We want you to stay in Grand Rapids when you graduate. And we don't know that if you don't use your voice and speak up."